Heated exchanges in social media arising from political developments continue to turn nasty and further divide Filipinos. 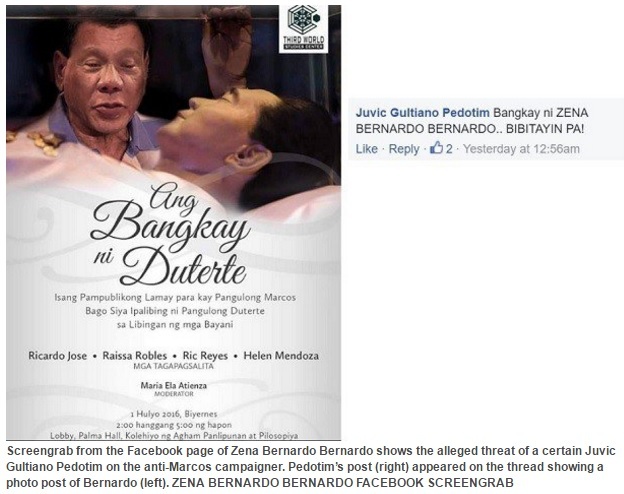 One of the leaders of an online community group opposing President-elect Rodrigo Duterte’s pronouncement on the impending burial of deposed dictator Ferdinand Marcos at the Libingan ng Mga Bayani, Zena Bernardo Bernardo has been the target of a death threat on Facebook. The person who posted the threat has been identified as Juvic Gultiano Pedotin–whom Bernardo claimed is a police officer, as his Instagram account photograph apparently shows. Pedotin posted the following comment at 12:56 a.m. June 18 to her updates on the Marcos burial issue: “Bangkay ni Zena Bernardo Bernardo… Bibitayin pa!”, Bernardo noted. “Fair warning to all diehard Marcos and Duterte operators and supporters… We have endured your bashing, foul words and violent threats. You continue to poison the core values of society. Let me warn you that we do not stand helpless. If you can crack down on us, we can crack down on you.”, Bernardo replied with defiance.